Having got all 4 ailerons to a point where I can start to apply block balsa support to build up to the capping level I can now satrt to sand down to ensure a flush fitting. The seats are made from plywood base, fitted to the seat rails (running fore and aft) and then have the very nice TLAC designed and made Leather cushioned seats studded in place. Silly I know .. but I have been putting this little item off as the first bend I put in it looked more like a kink and so stopped as I didnt want a 5 sided curve !! Completed this last night with the aid of some old pipe bending springs that I had from France .. very small bore .. so they were far less likely to cause a kink when trying to form a nice line from stringer to blend into the fin. 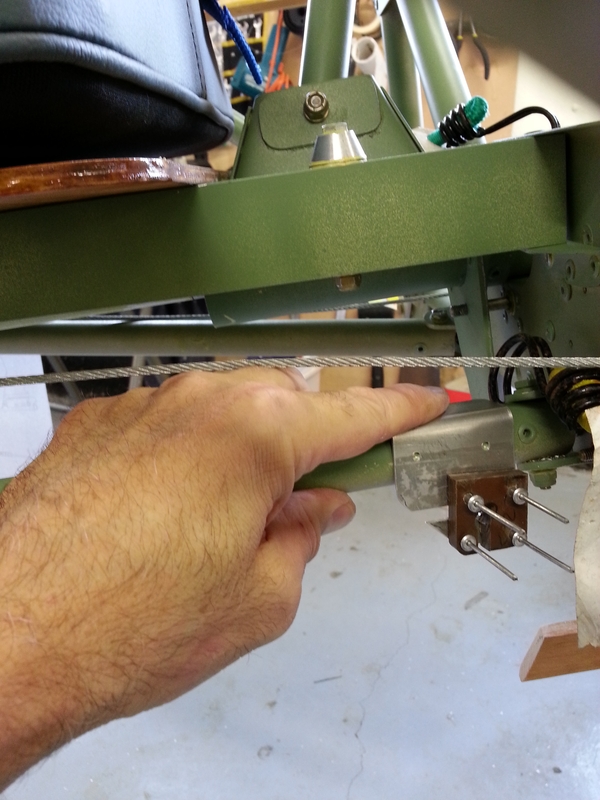 One end required cutting to allow it to seat either side of the stringer … the other end required opening out and flattening and then finally rounding … although this will be covered it will certainly still show through so pays to make it a good fit ! 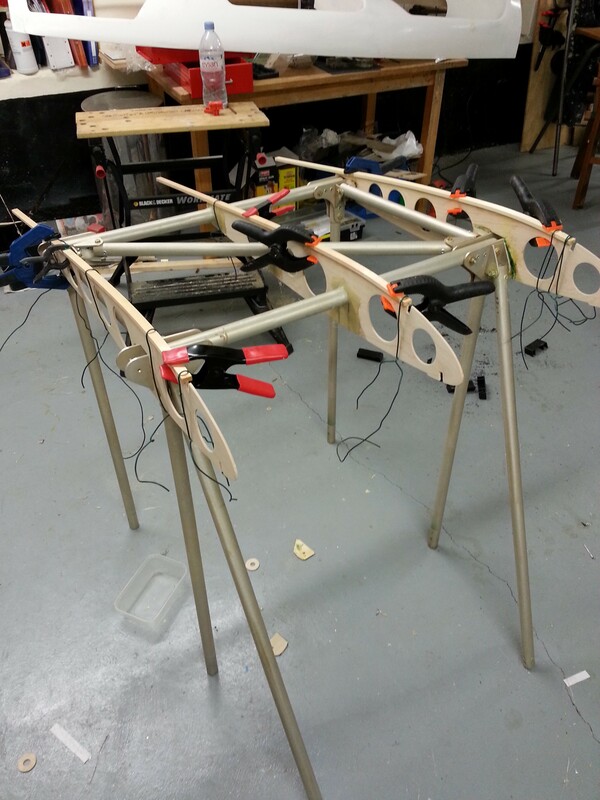 Wing – First Test Fit ! 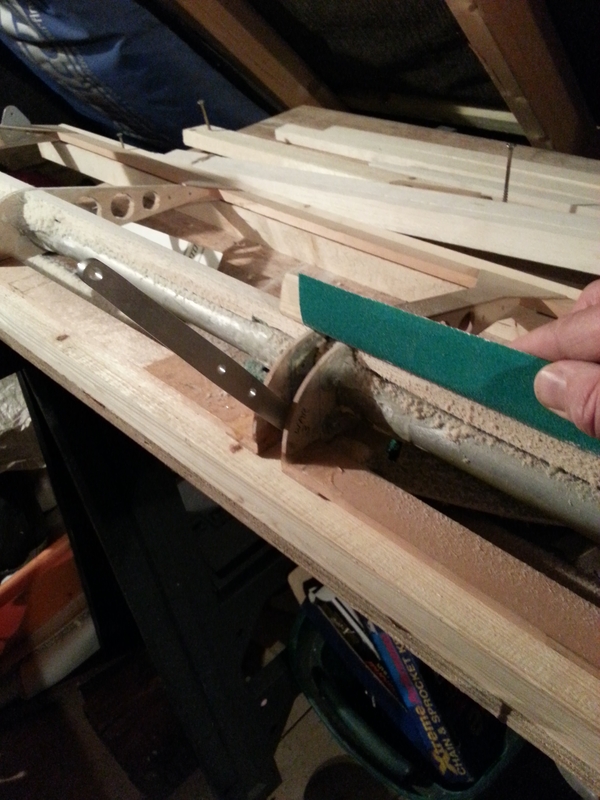 Sunday 10th November – bought some plastic saw horse trestles and these were cut down by around 40mm to ensure that offering up the first wing (Starboard Lower) was a mill or so aligned with the standard (out of the factory) holes. 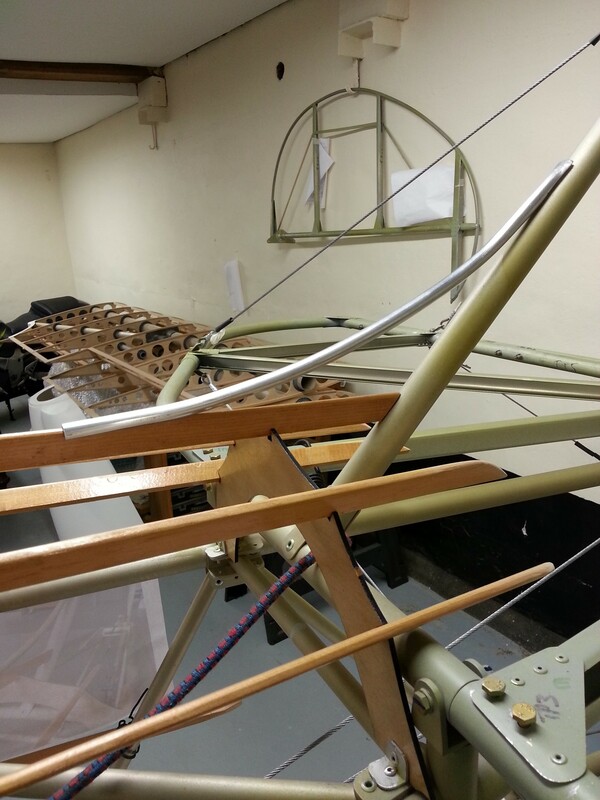 Long thin temporary split pins were used to locate the wing and get a sense of where things would line up. 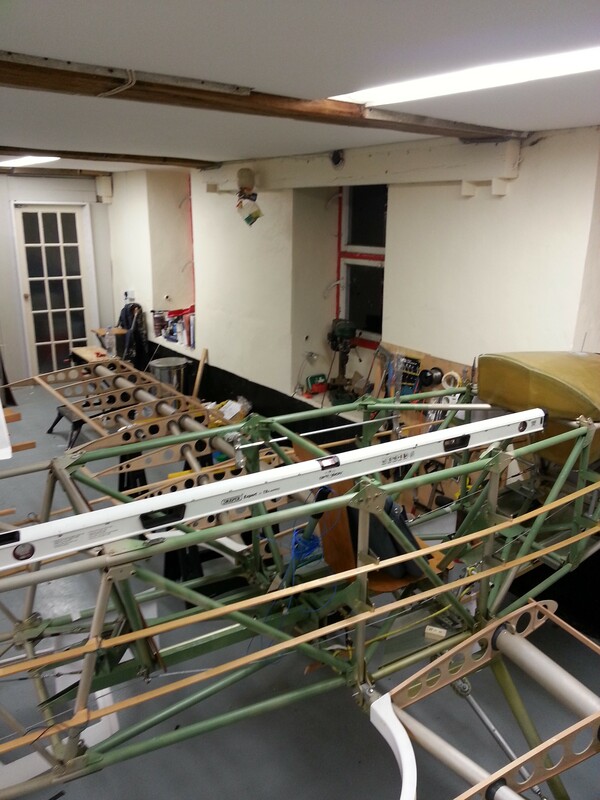 Lots more pre reading planned now on the general fitting of the wings as well as repositioning the ‘plane so that I can get wings either side (need to remove the rudder – so I can get around the back end to the other side of the workshop). TLAC offer the load of their drilling guide and extended drill bit to ensure that the wings fit correctly. 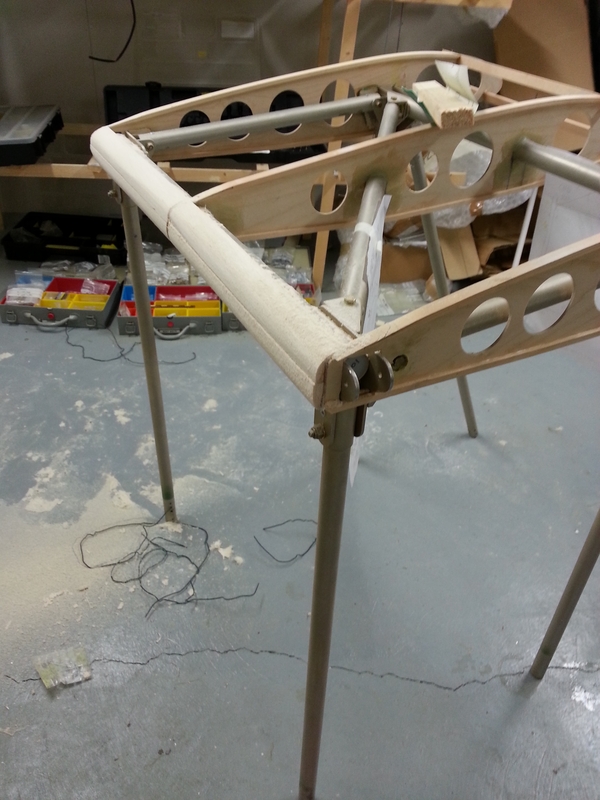 Then I have to work out a method of supporting the top wings … possibly a series of uprights with adjustable pegs to allow careful positioning. The centre cabane has 3 ribs that make up the basic surround. 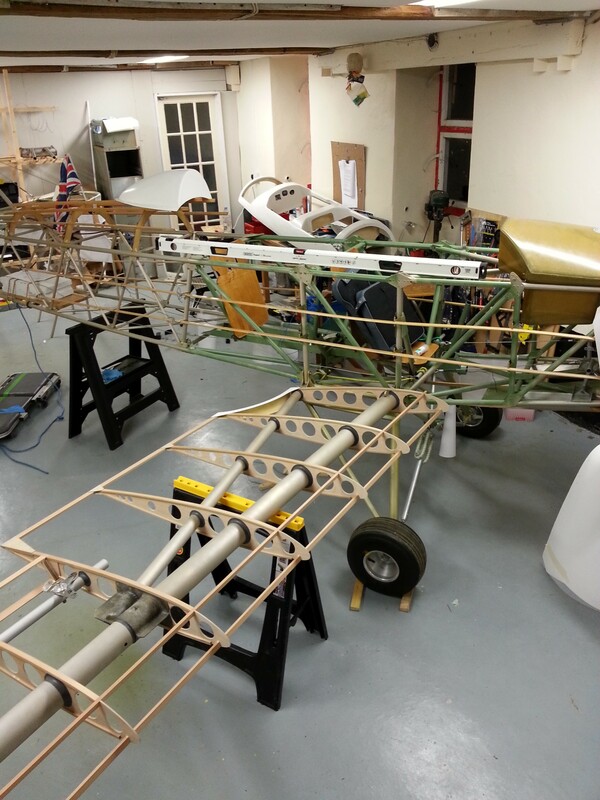 The outer two ribs are fitted and bolted to the frame using ply doubles to ensure that the bolt head can sit as flush a possible and so not impede the wing fitting. 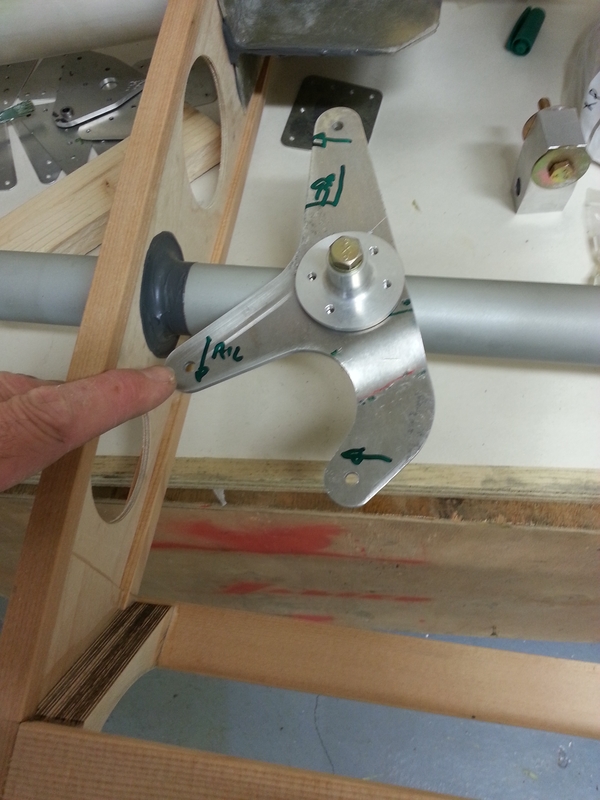 Once these are fitted the capping beech can be added – tricky as it is quite a bend on the upper section so a combination of clamps and twisted wire keeps it in place whilst the Aerolite goes off. The trailing edge is shaped ready for the balsa filling to be epoxied into position and then sanded to profile. The stringers are fitted top and bottom and then the top leading edge sheet ply. Gussets are finally added before smoothing the whole thing down. The aileron return leads come back through the trailing edge and then travel under the body (above the driving aileron leads at the back end of the control column). 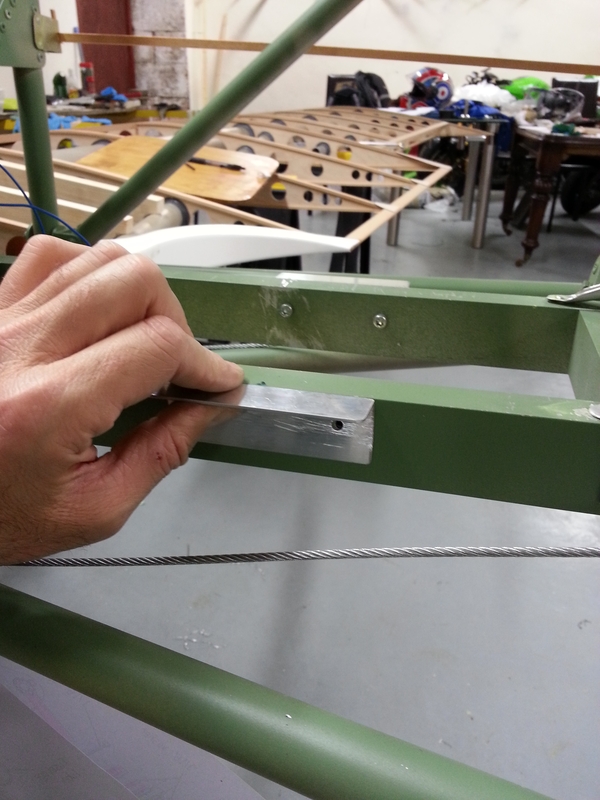 To keep them clear of the body they run through small metal angle brackets which have paxolin plates riveted in place to ensure that the steel cable (3.2 multi strand steel) rub against paxolin vs the steel bracket. Aileron bellcranks are located one in each lower wing. They turn effectively Left/Right motion into fore/aft motion that can then drive the aileron operation.